The Canadian Journal of Plant Pathology is published quarterly by the Canadian Phytopathological Society. Members of the Canadian Phytopathological Society receive a printed copy of the journal, on-line access or both. La Revue Canadienne de Phytopathologie est publié trimestriellement par la Société Canadienne de Phytopathologie. 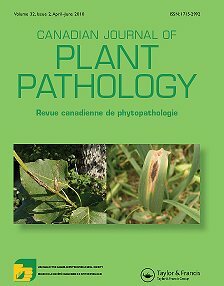 Les membres de la Société Canadienne de Phytopathologie reçoivent une copie imprimée de la revue, l’accès en ligne ou les deux. The Canadian Plant Disease Survey can be downloaded through the links on the next page. Starting in 1997, The Canadian Plant Disease Survey is only available in electronic format. Previous editions were published in hardcopy format and are available through libraries. The electronic formats can be downloaded and viewed using Adobe Acrobat pdf format.